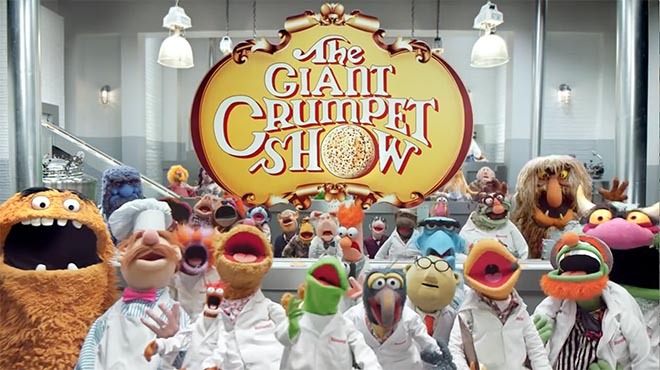 Warburtons, the British bakery, has launched the Warburtons Giant Crumpet Show, an advertising campaign featuring The Muppets and chairman Jonathan Warburton. The 120-second commercial is part of a £25 million campaign to launch the bakery brand’s new Giant Crumpet’s range, claiming the only way to make the UK favourite better, is to make it bigger. The commercial features Kermit the Frog, Pepe the Prawn, the Swedish Chef, Fozzie Bear, Statler and Waldorf, Sweetums, and Miss Piggy, who run through a revised version of their opening number to convince Jonathan Warburton to sponsor their show. Look out for references to Donald Trump, I heart Bolton, and a reference to the Manchester Arndale shopping centre. The campaign includes the 2 minute commercial, a 1.30 behind-the-scenes video, a 1.40 minute sing-a-long version, and a 20 second answer to a commonly asked question about Giant Crumpets. And how ’bout my self-toasting crumpet? The Warburtons Giant Crumpet Show campaign was developed at WCRS by executive creative director Billy Faithfull, creatives Andy Lee and Jonny Porthouse, agency producer Helen Powlette, strategy director Liz Baines, planner Angharad Thomas, account team Louise Davidson, Gemma Dodds, Sally Borda, Charlotte Robison, and Louis Lunts. Filming was shot by directors Declan Lowney and Kirk Thatcher via Another Film Company and Soapbox Films with producers Richard Berman and Simon Monhemius. Editor was Leo King at Stitch Editing. Post-production was done at Finish by VFX producer Louise Unwin, VFX supervisor/lead Flame Jason Watts, colourist Paul Harrison, Flame artist Andy Copping, nuke artist Kayley Fernandes, CGI team Alaric Holberton and Kirsty Gillmore. Sound was produced at Grand Central by sound engineer Ben Leaves. Music, published by Warner Chappell, was arranged by Eddy Mitchell. Media was handled at Mindshare. PR was handled by Freuds.